Your home-from-home for excellent service, and fully-supported, hassle-free ski holidays. 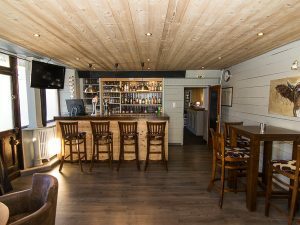 Our home base and longest-running location, the Aravis Lodge is a sociable chalet-hotel, exclusively for the use of Ski Weekender’s guests. As such, everything we provide here has been set up specifically to cater to your short ski break needs, including great food, on-site ski hire and a high level of personal service from our resident ski team, with everything tailored to get you the most skiing with the least hassle. 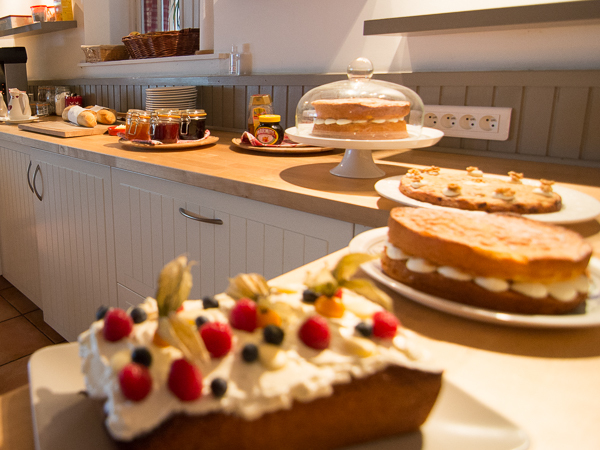 The Aravis Lodge combines the best aspects of staying in a catered chalet, with many of the same benefits as a hotel. For example, it has a lot more communal space and facilities than typical chalets, but retains an easy-going, sociable feel. You’ll regularly find guests sharing a drink in the bar, unwinding in the sauna, or simply dozing in the comfy lounge after (another) slice of cake, as our highly popular afternoon tea is included at the Lodge. The dining room also plays host to some memorable meals, with 40+ people around large banquet tables, sharing stories and making new friends, so our guests regularly tell us the Lodge is like their home away from home. Then for advice about snow conditions and the best places to ski, where to have a leisurely lunch on the piste, or to go for some fun après ski, our friendly team are always around to pass on their first-hand experience. We also have a snow-rep available in the resort itself at the start of your short break, to help with additional guidance on the day. 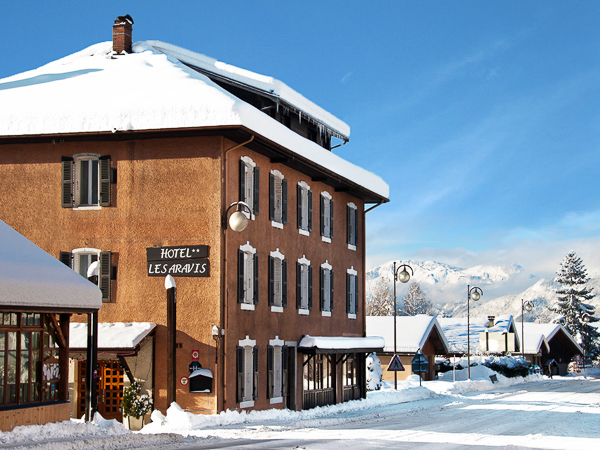 As the name might suggest, we are located in the midst of the Aravis Ski Domain – in the village of St Jean de Sixt. The resorts of La Clusaz and Le Grand Bornand – with their fantastic skiing – are just 5 minutes or 2km away. With our own fleet of minibuses, we drop you off right at the foot of the ski lifts first thing in the morning and pick you up again at the end of the day, making it the height of convenience. So no need for public ski buses or long treks with your gear (although the ski buses also run regularly throughout the day too). So all of this combined, along with the excellent skiing in the area, is why we get to welcome back so many of our guests to the Aravis Lodge time after time, and we hope you will be one of them! 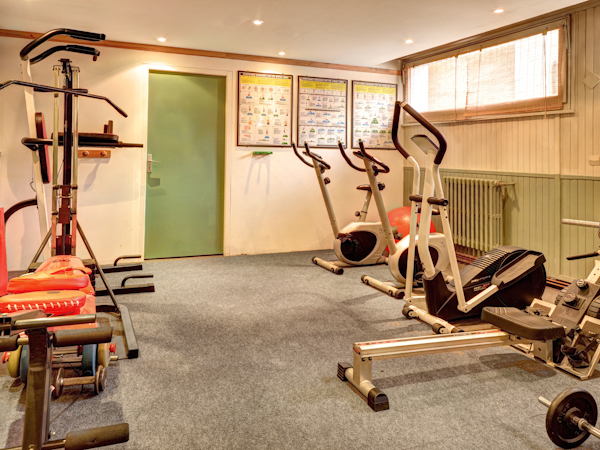 Everything aimed at maximising your ski time; hire, bar, sauna, great food & hospitality under one roof. The Lodge has 18 ensuite bedrooms on its first and second floors, with all bathrooms having recently been fully renovated in a fresh, contemporary style. Most rooms are 2 person twin / doubles, plus there are also 4 larger family rooms, which sleep up to 4 in twin / double beds plus an adult-sized bunk bed. All rooms have fluffy duvets plus extra blankets. Bath and hand towels are provided, along with complimentary toiletries. Free WiFi is available throughout the hotel. The ground floor of the Lodge has a spacious dining and breakfast room, with complimentary tea and coffee available throughout the day. 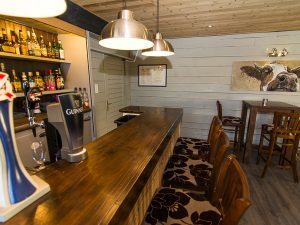 It also has a large, sunny lounge with comfy sofas, a smaller TV room, and a cosy licensed bar. The bar has draught beers (Kronenbourg and Guiness) on tap, along with a wide range of spirits, bottled beers and soft drinks. On the basement level you will find the ski/board/boot room with heated bootwarmers, and all the latest hire equipment on-site for your convenience. There is also a fully equipped gym and fitness room, with CV and weights machines – in case you haven’t had enough exercise already. The modern sauna and massage room always seems to be much more popular however! We are told time and again by our guests that the food and wine we serve here really stands out compared to many ski chalets. We believe food is an essential part of a good holiday, particularly a ski holiday, which is why we ensure all our meals are wholesome, filling and delicious. Our professionally trained chef team cook all our meals with care and attention, using local suppliers and healthy ingredients. 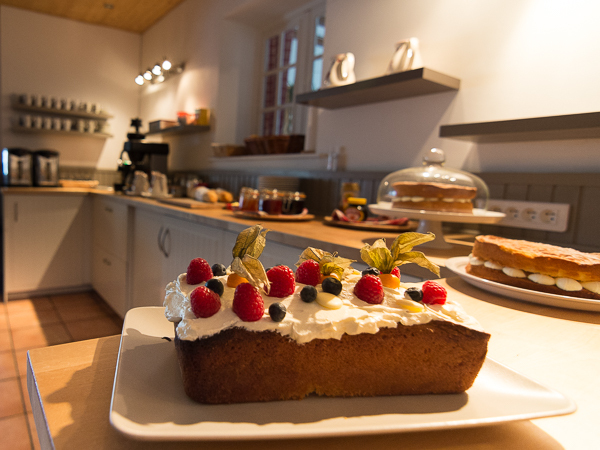 Our homemade cakes always seem to disappear in a flash at afternoon tea time too! A generous allocation of red and white table wine is provided throughout dinner. We are able to cater for most dietary requirements, including for vegetarians and vegans (we are one of the few places in the French Alps certified by the Vegetarian Society – read more here). 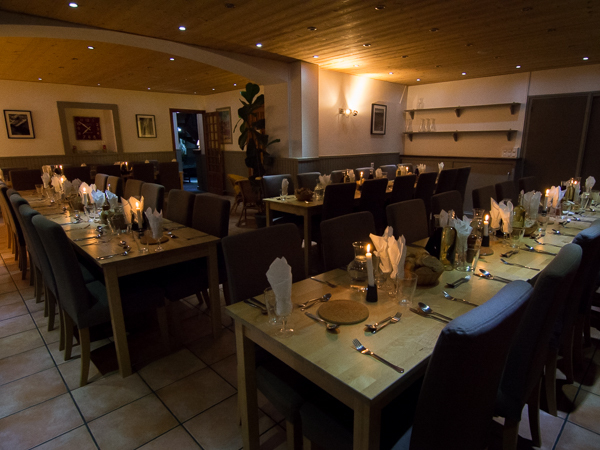 We can also accommodate people with gluten, dairy and nut-free diets. Please just let us know in advance by completing the relevant section in your online booking space, once you have made a reservation with us. * Guests regularly tell us that the Aravis Lodge feels like their second home and that it’s like coming to see family. That’s how we like to think of our returning guests as well, and we look forward to welcoming you into the Ski Weekender family! The Lodge is located in the heart of the small village of St Jean de Sixt, just an hour’s airport transfer from Geneva, ideally located between the two Aravis ski resorts of La Clusaz and Le Grand Bornand, only 5 minutes from each. Access to the lifts and slopes is via our free shuttle service – we run you out in our own minibuses in the morning (0830 – 0900) and back in the afternoon (1615 / 1645) – or via a free ski bus which runs every 30 minutes throughout the day. In either case, access to excellent skiing is just 5 minutes away. 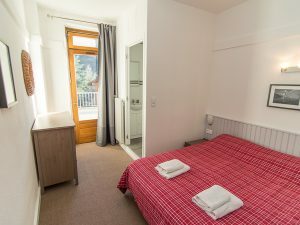 There are 3 restaurants, 3 bars, an ATM, post office, mini supermarket and several ski gear and regional produce / gift shops very close to the Lodge – from a few seconds to a couple of minutes walk. For guests looking for a night out in the central resort, we can arrange lifts up to La Clusaz after dinner on an ad hoc basis, and can provide contact details for local taxi companies to book a lift back at the end of the night. La Clusaz has a dozen or so bars and 2 clubs which stay open until the small hours of the night. Our Classic package is our tried and tested formula, refined over more than 10 years to get you the maximum time on the slopes, with excellent levels of service, yet with the absolute minimum of hassle. All you need to do is organise your flights, get to Geneva airport, and from there on we do all the thinking and organising for you! Our fully-supported service takes the stress out of things like ski hire and getting your lift pass, with our team always on hand to help or answer any questions you may have, making this package particularly good for beginners, families or those new to the Aravis ski area. At the Aravis Lodge we only accommodate Ski Weekender guests, so practical timings are completely tailored for your benefit, plus we can offer you a much more personalised service. On-site ski hire is available until the end of the night on your arrival day, so all arriving guests can get fitted with gear and waste no time on your first morning. Guests can also keep their rooms in the Lodge until 1600 on departure day, allowing you to shower and change before leaving for your return flight. The full service of our dedicated, resident ski team. *Airport transfers are included in all of our packages, for flights scheduled to arrive into Geneva airport between 1500 – 2115, and for departure flights taking off at 1600 or later. On departure, your airport transfer will leave the resort 3 – 3.5 hours before your flight time, meaning an evening flight from about 2000 onwards will let you ski all day on your last day. Airport transfers outside of these times can be arranged at a locally-charged supplement – please contact us for full details. 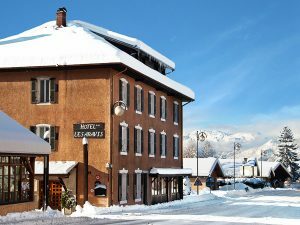 Stays at the Aravis Lodge are possible throughout the winter season, from the end of December to mid-April. Prices are per adult, assuming 2 people sharing a twin / double room. 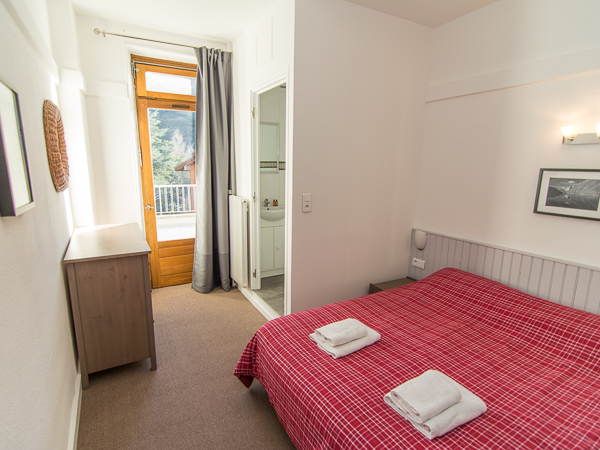 Some larger 3/4 person rooms are also available. 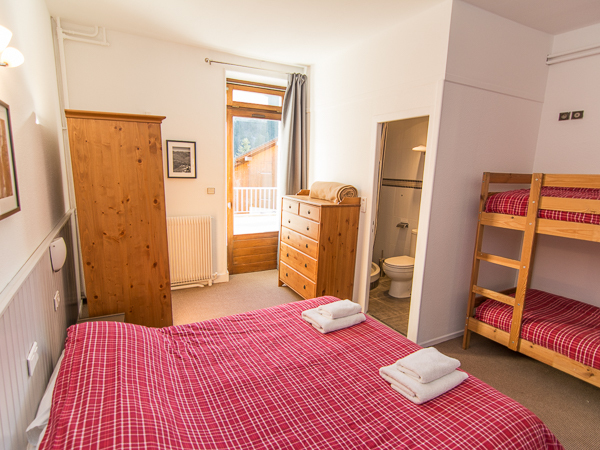 The package price at the Aravis Lodge includes chalet board – i.e. breakfast, afternoon tea with cake & 3-course evening meal with wine. Evening meals are not included on Wednesday nights. Also included is a full Aravis Region Lift Pass, covering 220km of skiing across the ski resorts of La Clusaz and Le Grand Bornand, plus airport transfers on standard break start / end dates, for flights scheduled to arrive into Geneva airport between 1500-2115, and depart 1600 or later. Transfer time from Geneva to the Aravis Lodge is just 1 hour. 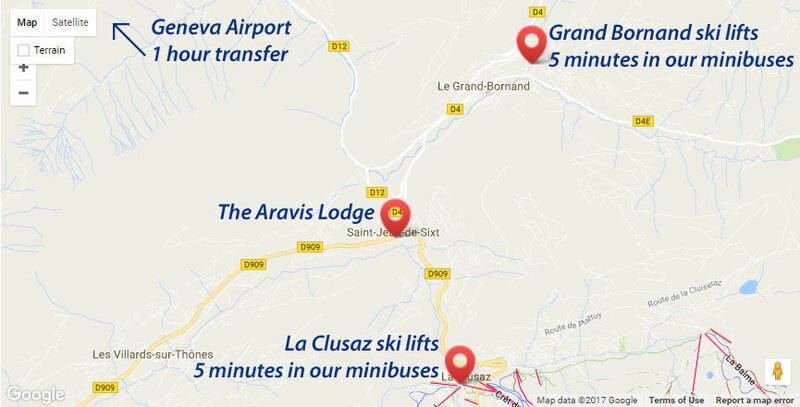 The Aravis Lodge has the most convenient ski hire facilities of any of our locations – it’s mere steps away, on-site! You can grab a cup of tea (or a beer!) 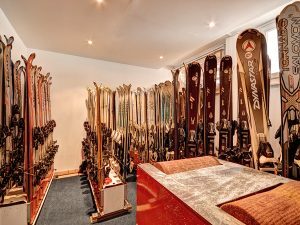 and head down to the Lodge basement on your arrival afternoon / evening, at your leisure, and get fitted up with skis, board and boots from our comprehensive range of gear. We have a selection of kit for all abilities and varying ski styles, and a lot of different makes of boot to help find the best fit. We can also hire helmets, alongside skis and boots. Ski hire doesn’t need to be booked in advance, and is available from €50 – €72 for 3 days, €62 – €94 for 4 days (per person price for skis, boots and poles). At the Aravis Lodge, hire of ski jackets, trousers, goggles and gloves can be pre-arranged. 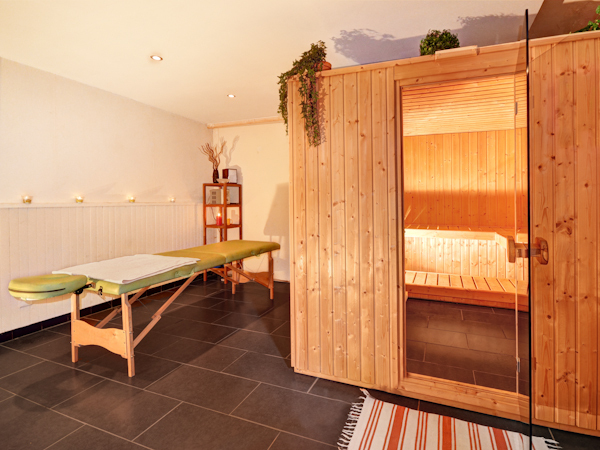 The Aravis Lodge has a sauna and massage room on the lower ground level, next to the on-site ski hire suite. The sauna is available to all guests in the afternoon and early evening. Post-ski sports massages can be pre-booked, depending on availability. with a local masseuse. We’re very proud of the great feedback our guests pass back to us and the word-of-mouth recommendations they pass on to their friends. Click on the TripAdvisor logo to see the many reviews from guests who’ve stayed at the Aravis Lodge. 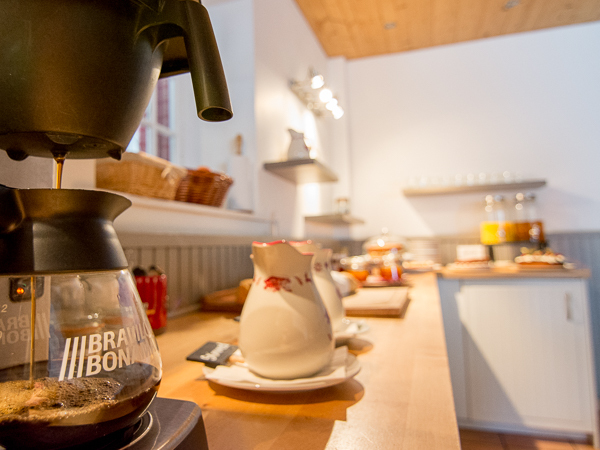 Want to stay with us at the Aravis Lodge... ?